Mix 8 ice cubes with 100ml of Malibu and the vanilla ice-cream together in a blender. Pour the mixture into a tall glass and place it in the middle of the fishbowl. Fill the fishbowl with the rest of the ice cubes and the crocodile sweets. 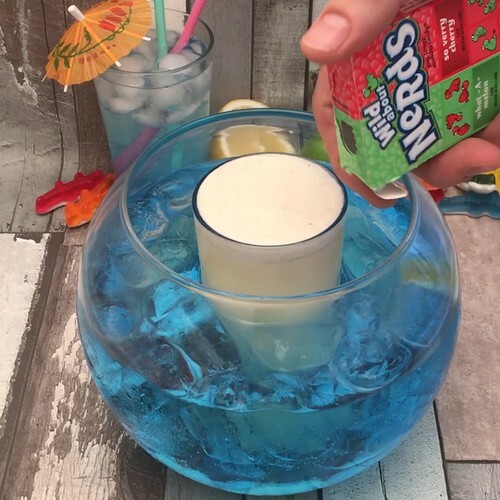 Pour in 600ml of Malibu, the blue Curaçao, and the Sprite®, then add some green Nerds. Cut some slices of lemon, and arrange them around the edges of the bowl. Cut the lime into 2, then make 4 cuts towards the base of the lime end and push down, placing it on top of a straw with 2 cherries, to create a palm tree and coconuts. Plant your palm tree on the ‘island’ and arrange more straws in the ‘water’. Cheers!